The numbers of undiagnosed diabetes in western countries is astonishingly high. Even when people get the right diagnosis (often YEARS after they’ve developed the disease) there’s often little support for how to make appropriate changes to lifestyle and way of eating. I stumbled on this inspiring Type 2 diabetic story today from a newspaper in West Virginia, the Charleston Gazette. It has a happy ending…. Recognize diabetes before it’s too late! Everette Roberts in October, 2011 (left) and six months later in April, 2012. Quitting soda pop, eating right and staying active has made a world of difference, I don’t get sweats and blurry vision any more, I’ve got a lot more energy, and my outlook is better. WILLIAMSON, W.Va. — The winter of 2010-11, it snowed a lot in Mingo County. Fifty-four-year-old Everette Ray Roberts was shut in for days, me and my dog, in a small trailer perched on a steep hillside near Matewan. A rugged bachelor, Roberts has three ruptured discs in his back from heavy lifting. “I was constantly dizzy and thirsty, with all the snow, I wasn’t getting out and walking around, doing stuff. I’d gained a lot of weight. My eyes got blurry. I’d get so shaky, sitting on the couch watching TV, and I was pouring down the 24-ounce bottles of pop, five or six of them a day. It was like adding gasoline to the fire, all that sugar, but I didn’t know it. 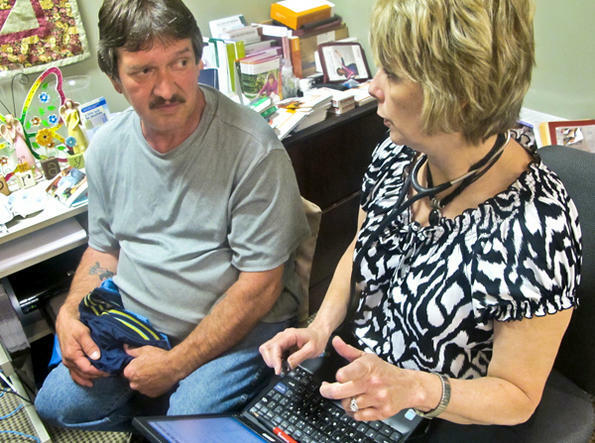 He was one of an estimated 69,000 West Virginians who have diabetes, but don’t know it. When he finally did go, the doctor told him he had all the symptoms of diabetes: blood sugar was up the high 400s and A1C [the three-month blood sugar levels] was 12.5. His doctor referred him to diabetes educator and nurse practitioner Vicki Lynn Hatfield. Hatfield and her partner help about 500 of the area’s estimated 3,500 diabetics figure out how to control the condition from day to day, despite sometimes harsh realities of life: shortage of cash, two jobs, kids, and so on. “I lucked out, if it hadn’t been for Vicki, I’d probably be in kidney failure now,” Everette said. He and Hatfield went over what he ate, how often he ate, his schedule, his physical activity. To get rid of his dizziness, shakiness and blurry vision, they planned specific ways he could change what he ate or when he ate and increase physical activity every day. They also got his medicine adjusted. Everette went to Hatfield’s group Diabetes Self-Management Classes at Williamson Memorial Hospital. He learned how to shop for food that wouldn’t set off his blood sugar, how to read his own blood sugar levels, how to cope with periods of depression. “Everette is somebody who, once he found out how to control his diabetes, he took the reins,” says Vicki Hatfield. A year later, his blood sugar was in normal range. He requires less medicine to keep it there. Hatfield dished it out to him in small steps, he said. He learned what foods would keep him stable and how to lower his blood sugar by taking a walk, how to buy healthy foods on a budget. “There’s a whole lot more to it than what I thought…. I stay on the move now, 24/7 , I cook for myself. I take the skin off my chicken, and bake it instead of fry it. I make myself a lot of salads. I like salad and I put all kinds of stuff in them, vegetables, meat. “People are not born knowing the symptoms of diabetes, and they aren’t born knowing how to control it, and it takes more than a 15-minute doctor visit to help them get a handle on all they need to know. She keeps trying new ways to stamp out diabetes . Two years ago, she helped start a Mingo County Diabetes Coalition. Now they have a five-year grant for $50,000 a year through Marshall University to spread diabetes awareness and prevention through the county. 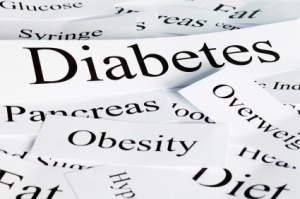 Hatfield now offers diabetes prevention classes. The coalition plans to post symptoms of diabetes in store windows and telephone poles all over the county. “I would tell anybody, the bottom line of it is, if you don’t set it in your mind that you’re going to get it under control, then it’s not going to get better. Thank you for the reminder. Very timely. The sad thing about this is a considerable amount of damage has already been done and is probably irreversible, such as retinopathy or other neuropathy. It’s our stupid American diet of wheat, corn, sugar that has done it to so many people. Have you read Dr. Davis book “Wheat Belly” that talks about the inflammatory effects of the modern wheat that has been so genetically modified it’s much more inflammatory thanthe wheat our parents used to eat. Even still, the US pushes indigestible whole grains as a solution. Even more inflammation and leaky gut syndrome. Read Dr. Michael Eades blog and Mark Sisson as well. Both my sisters have diabetes and my brother and I don’t, partly because we are both O blood types and our sisters are A blood types, who are more prone to diabetes. Os can get it too if they don’t change their diet. Our diabetic mother was an A. It also might be on the A type gene. She had blue eyes as does one of my sisters. The other has green. My brother and I both have brown eyes like our Greek daddy. Seems like there is some connection. But if we eat lots of carbs, we get chunky and our blood sugar goes up too! Thanks for that , Cheryl. Great story — I knew people from Williamson — it’s a coal mining town with a lot of folks just barely making ends meet. It’s good to see they have someone to give them the tools to fight diabetes, and are willing to take up the fight themselves instead of living in denial or expecting the doctor to fix it with just a pill. Thanks for sharing this. Robin, great story! Thank you for sharing. Here in California we obtained enough signatures to get the GMO labeling requirement on the November ballot. Hopefully, people will vote it into law, in spite of the huge amounts of money that will be used to fight the measure. All of us need to become proactive regarding our health and food. If we don’t learn how to take care of ourselves, we are in big trouble! on April 30, 2012 at 11:13 pm | Reply Jan J.
I was diagnosed with type 2 diabetes a couple of years ago at a free clinic. I knew I had not felt well for a long time, but with no insurance and two kids to support on my own I had no means to go to the doctor. I had a 536 fasting blood sugar and they said I had probably had it for some time. But I had no means to go to diabetic education or get a primary physician. So it was up to me. I researched for hours on the internet, bought some books, checked some out of the library. This has been the positive side of diabetes – learning more about healthy foods, making a better effort to exercise. I did not eat terribly beforecompared to most – we usually ate whole-grain pasta, lots of veg and fruits, small sweets, no soda, very few prepackaged foods. But even so I treated us too often and my kids love Asian food with fragrant jasmine rice. My advice is to not try to do it all in one day – gradually but steadily work on the negative areas of your diet so it is easier to stick to and becomes your natural way to eat. My kids recently let a bag of Oreos go stale because they were eating the fruit, cheese and whole-grain wasa crackers I keep around. They now think of packaged sweets as “too sweet/sickly sweet” as I make most of our treats with things like oatmeal and stevia and we just eat a small bite rather than a big one. One of my daughters far prefers my hard-boiled eggs to something sweet. My biggest frustration is seeing the countless adds for sugary, white-flour, artificially flavored and colored foods that will lead to more generations of rampant diabetes. I agree wholeheartedly with what you say. Jan, thanks for that inspiring story. So interesting that given a chance and some encouragement children are perfectly capable of change. Jamie Oliver has achieved so much in this regard. on April 30, 2012 at 11:33 pm | Reply Dianne P.
Thanks Dianne–it is a very worrying and sad trend. Love this story. Very inspiring even for those of us that are not diabetic but live a healthy lifestyle. Can’t believe the difference in his before and after photo! Thanks for sharing this article. How did you know you had diabetes yourself? What were the first symptoms? I was encouraged by a friend who had prostate cancer to have a blood test for that. The results showed my blood sugar level to be within range of pre-diabetes. My doctor had me test again after six months and the trend was upwards. I was lucky; thanks to my friend, who survived and flourished after his bout of prostate cancer, I found out about the diabetes. I had no symptoms I was aware of that pointed to me being a Type 2er. In England, some of our local chemists give people free tests for diabetes–they just prick the thumb for some blood. Good idea. My mother was diagnosed with diabetes when she was in her seventies–she didn’t know she had it!! but she controlled it by diet. She didn’t inject herself with insulin. At Christmas, she always fancied a piece of Christmas cake and thought she wasn’t allowed to but the nurse permitted it. Diabetes is a strange condition. People think they are not allowed sugar but they have to have some sugar to keep their blood sugar levels up. Good that you print these articles for awareness. Robin it saddens me to think that in this day and age there is still not enough education about diabetes, this thing is a killer.When we go to the hospital for Jimmy there are more and more younger people. But it is encouraging to read that people are willing to get themselves checked out, and it does help to highlight this. I am aware that medical attention is expensive,we in England are so lucky in that we do not have to pay when we visit our G.P, but life is so important, It’s the old battle cry do it sooner not later. I appreciate the information/articles you put on your blog reminding and educating people on how important it is to take care of oneself when dealing with diabetes. I am pre diabetic and have a strong family history of diabetes on both sides of the family tree (mother and father). The recipes and cook book do reflect that diabetes does not have to limit the enjoyment of food. Thanks for the article. I worked in the area of Hungtington, WVA, for several years, when it was tagged as “the fattest city in the United States.” It is truly an area ravaged by the scourge of diabetes. Thank God for those, like yourself, who are taking an active role in fighting this. BTW, I posted on Dr. Mark Hyman’s website – http://www.bloodsugarsolution – about your new book of recipes. I hope that those who belong to that wellness community will use your book as a resource. I also invite you, if you are not familiar with it, to look in and join if you like. I am on my third week of the program and I’ve dropped 15 pounds and my blood sugar levels have almost normalized. I’ve stopped insulin altogether and when my doctor advises, I’ll drop off of oral medication as well. Thanks again, for making the journey more…. flavourful! Congratulations on your success so far–truly inspiring. I shall check out Dr. Hyman’s site–thanks for that. Lloyds pharmacies in England give anyone a free test for diabetes. They prick the thumb and tell you in a minute or two if you have diabetes or not. That is good to know–where are Lloyds pharmacies situated, Heidi? I rang them up yesterday and found out they have branches all over England. Thank you, Heidi–I’ll do a supplementary on that.